>Email from a Souns parent! I just thought you’d appreciate the picture I attached of my 19 month old daughter sitting in front of our Christmas tree. 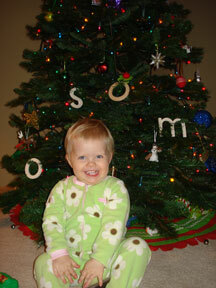 Last night she thought it would be a good idea to decorate the tree with her Souns symbols. She was proud of her accomplishment. We are a little late at ordering our second set, but I did yesterday in hopes they will be here by Christmas so Santa can deliver her next sound. Anyway, my daughter knew her first three sounds months ago and has fun playing hide the sound. We also ask her to give us the /s/ and she goes right to the /s/ and gives it to us. She can even verbalize the sounds herself without any prompting. So, thank you for making Souns. We really enjoy them.